We're officially done with Week One. In just seven days after taking his oath of office on June 30, President Rodrigo Duterte's administration has been visibly busy at work, imposing numerous changes on our current government structures and policies. 1. The President promised to streamline government processes to make things easier for us. Duterte's first order to all agencies was to reduce the amount of time it took for the public to apply for and get their government-issued documents. 2. Free National Museum entrance! The National Museum decided to waive its entrance fee for everyone starting July 1. Prices used to range from P50 to P150. The National Museum is open Tuesdays to Sundays from 10AM to 5PM. 3. The new PNP chief subjected top police officials to a surprise drug test. Just a few hours after the new Philippine National Police chief assumed his post on Friday, Director General Ronald dela Rosa subjected top police officials—including himself—to a surprise drug test where at least 11 cops turned out positive for illegal drug use. Dela Rosa also called out corrupt law enforcers to surrender to him within 48 hours or be dealt with accordingly. 4. Malacañang declared July 6 a holiday. The new President signed an executive order declaring July 6 as a non-working holiday in observance of the Muslim tradition of Eid'l Fitr. 5. The President instructed the Department of Education (DepEd) to improve drug literacy. On Monday, Department of Education Secretary Leonor Briones said they were already reviewing the current curriculum to strengthen drug education lessons starting with Grade 4 students. Briones said the President personally instructed her to make drug education more practical so students can understand it better. 6. Duterte named five police generals allegedly involved in drugs. You know Duterte meant business when he name-dropped top police officials, who according to his sources, were protectors of the illegal drug trade during the 69th anniversary of the Philippine Air Force. 7. The Department of Agrarian Reform (DAR) opened gates to rallyists after nearly two decades. If you've passed by Quezon City's elliptical road at least once in the last 18 years, then you've probably noticed a group of rallyists camped out at DAR's main gate. On Tuesday, DAR Secretary Rafael Mariano led the reopening of those very same gates to symbolize the end of the divide between the government and the farmers. 8. 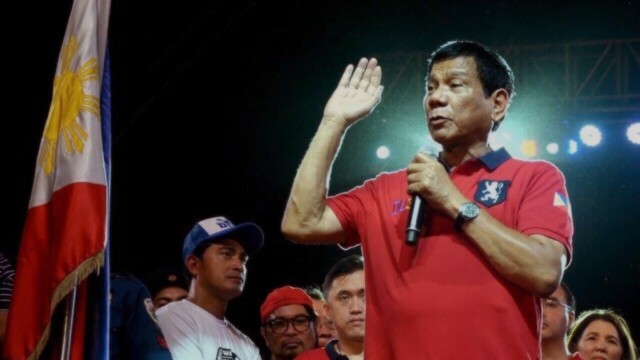 Duterte performed the ceremonial toss during the Gilas-France game. The President's presence during the Olympic qualifiers game between Gilas Pilipinas and the French national basketball team was enough to boost the morale of both our players and the Filipino audience. Although Gilas lost, they did give France an early scare in the first quarter which proved that we can go head-to-head against top-seeded international teams. 9. Duterte chose Bahay Pangarap as his official residence. Duterte followed in the footsteps of his predecessor, former president Benigno Aquino III, after choosing Bahay Pangarap as his official residence. The house has three bedrooms, one master bedroom, a reception area, and a dining hall where previous Cabinet meetings were held. Aside from this, a garden and a pool adjoin one of its entrances. The best part would probably be its proximity to the Malacañang Palace as Duterte only needs to cross the Pasig River via barge for five minutes to reach his office. 10. Duterte finally offered Vice President Leni Robredo a Cabinet position. Despite the earlier rift between the camps of the President and the Vice President, Duterte offered Robredo to head the Urban Development Coordinating Council. Duterte even called her during a live press conference at the Malacañang after he was asked by one of the Palace reporters whether he would still include the Vice President in his Cabinet. When we hear "laglag-bala" two things come to mind: The Ninoy Aquino International Airport and corrupt airport personnel hungry to pull a fast one on us. The President finally put an end to the notorious modus operandi by instructing the Aviation Security Group not to arrest, detain, or file charges against passengers who were found possessing ammunition. Now, frequent flyers won't have to worry about finding a bullet in their luggage as they know that airport scammers won't have anything to extort them with. How are you liking President Duterte's first week so far?